From Chris's mouth to God's ears. If only entrepreneurs would follow Chris's advice, I wouldn't be losing my hearing and I would have more time to play hockey. 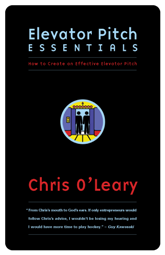 Elevator Pitch Essentials is a business book by Chris O'Leary that teaches entrepreneurs, salespeople, project champions, job seekers, and others how to get their point across in two minutes or less. Regardless of what you call it -- an elevator pitch, elevator speech, elevator story, or elevator presentation -- one tool every entrepreneur, salesperson, and project champion, and job seeker must possess is an overview of their Solution. With one, they will be able to catch the often fleeting attention of the people who can help them bring their Solution to life. Without one, they won't. The problem is that while many people talk about the importance of having an elevator pitch, most people don't know what an effective elevator pitch looks like. That's where this web site, and the book Elevator Pitch Essentials, enter the picture. This web site contains a number of essays and a blog that explain what an effective elevator pitch looks like and how to create one. Elevator Pitch Essentials draws upon the experiences of Chris O'Leary, a writer, speaker, consultant, and general expert in the fields of entrepreneurship and innovation who has worked for a number of software start-ups. Elevator Pitch Essentials is now available for purchase through PayPal or Amazon. You may also look inside Elevator Pitch Essentials if you would like to try before you buy. Elevator Pitch Essentials has been featured in, and Chris O'Leary has been consulted for, articles in a number of leading publications.